Recently, when I went to YO!Sushi with some friends, one friend asked me: “Do restaurants like this actually exist in Japan?“. Initially I was surprised by the question. Of course they do! 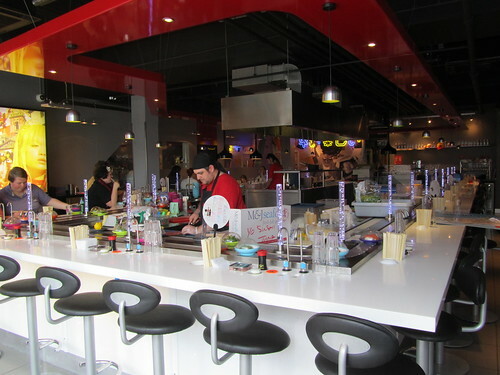 It hadn’t occurred to me that people might think that YO!Sushi was England’s take on a sushi restaurant. This style of restaurant, in case you don’t know, is called “kaiten-zushi” (回転寿司) in Japanese, which translates as “conveyor belt sushi“. 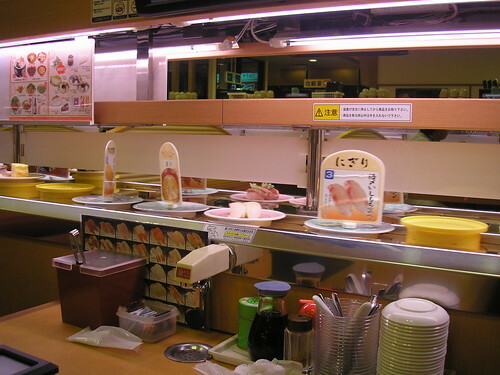 Kaiten-zushi restaurants can be found all over Japan and they’re particularly popular with families and young people. Why? Because, unlike their British counterpart, they’re very cheap. In most kaiten-zushi restaurants in Japan you will find that the dishes on the belt are one price, and that’s usually around ￥100 (80p at today’s rate) per plate. Compare that to YO!Sushi’s prices (plates start at £1.70), and you’ll see that there’s a big difference between the cost of conveyor belt sushi in the UK and Japan. If British prices made their way over to Japan I doubt kaiten-zushi restaurants would be half as popular. Another difference between YO!Sushi and Japanese kaiten-zushi restaurants is that, in Japan, you can drink unlimited green tea for free. In England you can get unlimited refills of green tea, but you have to pay £1.50 for the privilege. Also, when you order dishes that aren’t on the belt, you usually don’t have to speak to anyone in Japan. 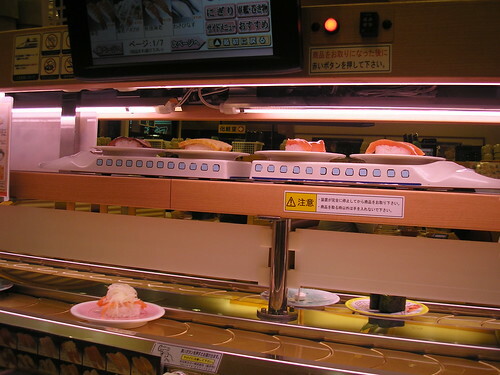 You just order through a touch screen and your food arrives on the sushi train. Honestly, how does it compare? I’m sure it will come as no big surprise to hear that the sushi at Japanese kaiten-zushi restaurants is a million times better than anything I have eaten at YO!Sushi. The very first time I went to YO!Sushi, before living in Japan, I thought it was good and I was pleasantly surprised by the sushi. 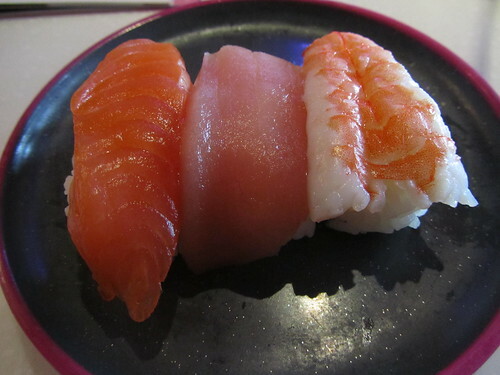 Now that I’ve been spoilt by living in Japan, I can’t help but judge YO!Sushi a bit harshly. When you order and get something freshly made, it’s good. But often the stuff on the belt has been going round and round and isn’t all that fresh. At YO!Sushi you can also order a variety of hot dishes, which are a bit hit or miss to be honest. Although I have eaten the takoyaki there a number of times, I must remind myself next time I go that it’s not very good. My favourite kaiten-zushi restaurant in Japan is Kappa Zushi (かっぱ寿司). There are stores all over Japan – click here to look for a store near you. Although I haven’t been to one in Tokyo, the website says there are ten stores there, so you have no excuse not to find one when visiting Japan! If you can’t make it to Japan and you’re in England, then you’ll have to make do with YO!Sushi. The food really isn’t bad at all, but it might make your wallet hurt a little. Of course, in both Japan and the UK there are many other restaurants where you can buy sushi. If you have money to burn, forget about kaiten-zushi restaurants and seek out a sit-down sushi restaurant. The quality will be much higher, whichever country you’re in. Great share! I still think the sushi in Southern California is better than the sushi in Japan, only because it is geared for American taste buds. By that, I mean things like Philly cheese and avocado rolls, things you don’t find on the menus of many Japanese sushi restaurants. My favorite kaitenzushi is Kurazushi!!! Miss it soooo much. 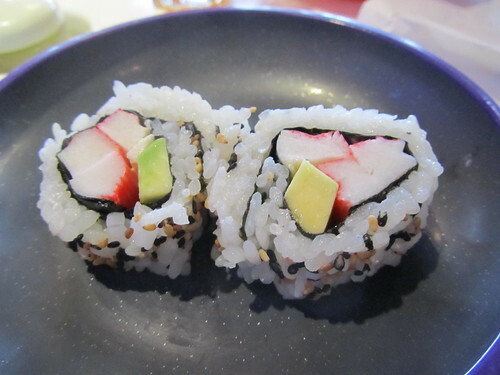 I really miss Japanese sushi, the American sushi rolls are nice, but it’s so different and often even weird. I need some Japanese kaitenzushi!!! Hi! I’ve just discovered this blog and I think it’s really cool! I love Japan too and I adore kaiten-zushi! I totally agree. We love kaiten-zushi and a favourite is Kappa Zushi which we are lucky enought to have a short drive from home. The prices are not too expensive and it is a great place for a family dinner. I enjoyed by first (and only) visit to a kaiten-zushi in Shibuya. Ate so much!